Just over seven days separate 30 general managers from the feeding frenzy that is the NHL trade deadline. Of course, recent years have resembled a salad bar more so than an all-you-can-eat buffet. While the blockbusters that fans and media love have become rare, the action at the deadline will still be there. There are already a host of names floating around the rumor wires as real and make believe insiders and sources report on the whispers they hear about the players who will end up being moved in the coming days. Marquee names like Ryan Miller and Ryan Callahan are making the rounds with fans of contending teams are waiting to see what their GM can poach from the annual swap meet. The 2014 deadline ought to provide a few fireworks specifically because of teams like the Sabres, Islanders and Oilers. All three are sliding towards the draft lottery in hopes that they win the right to pick first overall and each will likely unload some stars prior to the deadline. Based on many reports, Edmonton appeared to be very close to dealing Sam Gagner to Los Angeles prior to the Olympic break and Gagner is still said to be on the block along with Ryan Smyth and Ales Hemsky. The Oilers could certainly market a few of their other young stars in hopes of shoring up their blueline, but their five-year rebuild will likely continue into yet another draft lottery where their number of top-3 selections will grow to four after winning the draft lottery three years in a row (2009-2012). Losing John Tavares will likely ensure that the Islanders begin playing for 2015 as they’ll try to get a king’s ransom for Thomas Vanek and Andrew MacDonald as the two pending free agents will attract plenty of attention from teams battling for playoff positioning. Moving the two may also allow Garth Snow to protect his 2015 first round pick as Vanek and MacDonald could potentially net a first round pick each, giving Snow a security blanket, of sorts, for this year when he may need to give up his potential lottery pick to the Sabres as part of the Vanek/Moulson deal. Buffalo is expected to be very busy as Miller, Moulson and Steve Ott are all expected to be moved and each has their own market value as the deadline approaches. A few teams are said to be interested in Miller, although the number who will likely make a legitimate offer won’t likely eclipse five. My gut tells me he ends up in Washington where George McPhee is on the hot seat and his team’s goaltending has kept them from playoff contention this year. Ott and Moulson are said to have many more suitors and exactly where they end up is anyone’s guess. I wouldn’t be overly surprised to see Moulson end up in Ottawa where Tim Murray not only knows the prospect pool that he’d be gaining talent from, but his time with the organization may make negotiations go a bit quicker. Ott’s landing spot could be quite literally anywhere as his game can adapt to a number of different styles and any contender would be interested in adding an energy player like him. My money would be on a Western team, but that’s about as far as I would go in terms of guessing his destination. It’s also rumored that Ryan Callahan will likely be skating in a new city after the deadline and he’d also add the two way element that so many teams find valuable. While trading Callahan may be expected, I’m fully expecting to see at least one big trade that catches everyone off guard. It could be something similar to the Marian Gaborik trade last year that saw a host of players swapped between New York and Columbus. Regardless of who is moved, count on at least one of those to catch you off guard before the day is out on the 5th. Also keep an eye on the trade wire in the days leading up to the deadline as a few moves could easily come prior to next Wednesday. Warrior’s Dynasty (previously Franchise) glove line has long been a favorite at nearly every level of the game. Now, Warrior has a counterpart to their classic four-roll glove. The Covert glove line that was introduced last year is built on more of a tapered, anatomic fit as compared to the more traditional fit of the Dynasty gloves. Now that the Covert line is a year old, Warrior has started making some interesting changes to the line. One, is a special Limited Edition “World Tour” line for this year. The Limited Edition glove is designed with the Olympics in mind as the special edition colors that are available include Canada, the United States, Finland, Sweden, Russia, Quebec and a blackout version of the US and Canadian gloves. This line compliments the typical colorway availability in the DT2 glove and offers players a chance to get a unique pair of one-off gloves. While including Quebec is a somewhat odd choice when the rest of the designs are Olympic inspired, but the powder blue glove with a white cuff was too much to turn down and those were the pair I picked off the shelf. These are a good looking pair of gloves. The design standard on the line is basic but includes sharp edges that defines the graphic package in each color. The Quebec glove is just powder blue and white, so there is not contrast color on the back of the hand. However, the white trim surrounding the area where a contrast color would go helps the glove to pop. The DT2 uses Warrior’s Polygiene liner that not only wicks away moisture but also battles odor to keep your gloves clean and smelling fresh for a longer period of time. The Polygiene liner also utilized the Chillwave feature which keeps your hand cool which helps to work in unison with the Polygiene liner for a clean, fresh interior. As a former lacrosse player, I really like when a glove fits tight on my hand. I’m not overly comfortable wearing a loose fitting glove like a Dynasty or Bauer Nexus as the back of my hand is often separated from the back portion of the glove. The Covert offers a tight, snug fit without limiting mobility in the hand or wrist while playing. The fingers and knuckles are a little tight the first time you put these on, but bending the fingers back and over will help to break the glove in and after a couple of ice times you’ll be all set. As someone who not only prefers a tighter fitting glove, but coming from a pair of gloves that didn’t fit perfectly, I immediately noticed how much more comfortable I was stick handling, passing and shooting with the new gloves. I had gone from a pair that would sometimes feel perfect but other times would be far too loose for my liking. There’s no wiggle room here (no pun intended) as the fit and build of these gloves allow for a snug, comfortable skate. The change was so drastic that during warmups I actually was hitting the puck too hard while stickhandling because the gloves moved in perfect unison with my hands. After a few icetimes I haven’t had a moment where I was trying to adjust how my hands felt on the fly or feeling that I didn’t get good wood on a pass or shot because my wrists felt as if these were slipping out of my gloves. The gloves only required a pair of games to feel broken in as I did spend a little time breaking in the fingers and knuckles prior to my first game, so that may have sped up the break in process. I’m not only pleased to have made the decision to get an upgrade with my gloves, but choosing an anatomically designed pair will be something that goes a long way for me game-to-game. The Olympic break is finally upon us and, depending on logistics, could be the last Olympics that features NHL players representing their countries. Each team will have fairly limited practice time given the short time period between the NHL break and beginning of the Olympic tournament. This could serve as an early benefit for some of the assumed underdogs who have fewer NHL players making the hop across the Atlantic, but even those players will need to take breaks from their respective national teams for the Olympic tournament. The games will officially open on February 8 and the tournament will run until February 23. There are some changes between the 2010 and 2014 games in which the IIHF allowed the 2010 men’s and women’s tournaments to be played on NHL sized rinks as opposed to an international surface. The Sochi ice will be nearly 15 feet wider than the ice most of the participants are used to and that adjustment could also come into play as the tournament moves along. One interesting feature of this year’s tournament is the pool seeding. Based on the 2012 IIHF World Championships, there are decidedly difficult pools that were determined by the IIHF World Rankings. The US and Russians highlight an impressive Group A that includes Slovakia and Slovenia, a group that will not provide an easy out for anyone. Group B is headlined by the defending gold and bronze medalists in Canada and Finland, respectively. Norway and Austria round out the group as the Norweigians are no longer the new kid on the block for the tournament. Group C is filled out by Sweden, the Czech Republic, Switzerland and Latvia. That is perhaps the one group which could produce a surprising upset given the Swiss’ propensity to play big in international events. Group B may be the easiest to prognosticate with Groups A and B each having a pair of darkhorse teams that could cause trouble for the favorites. While the United States’ run to a silver medal in 2010 was impressive, they’re faced with an equally difficult road to a first round bye this year. Ryan Miller’s preliminary round dominance helped the Americans over Canada and to a top seeding for the quarters. It will take an equally impressive performance in goal (from Miller or Jonathan Quick) and the requisite goal support to lift the US over Russia this year. The US roster has more elite talent this year compared to what may be described as a more complete team in 2010. While leaving Bobby Ryan out was a surprise to many, the US roster still has some impressive talent in their top-six. 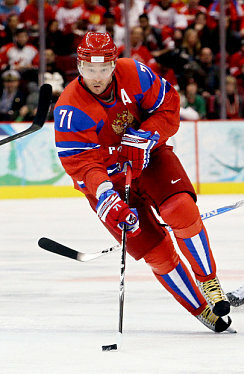 The Russians enter the tournament as the hometown favorite with plenty to prove after a disastrous showing in Vancouver. While goaltending and defense show as potential weak spots on the roster, the firepower they boast at forward makes them an immediate contender regardless of who is in net. Should Semyon Varlamov maintain a consistent level of play, he could easily elevate the Russians to the top team in the tournament. Both the Americans and Russians will need to be aware of the Slovakians in pool play. The Slovaks made a strong run to the bronze medal game and a fourth place finish in Vancouver on the back of a veteran lineup. While some of the old guard has moved on, a number of their young stars have come into their own at the NHL level. They will not only prove to be a tough team to defeat but certainly a squad which will make noise in the quarterfinals. Slovenia is brand new to the Olympic tournament and boasts just one NHL talent; Anze Kopitar. While Kopitar is truly a world-class talent, he will need a ton of help to lift the Slovenians to victories in Sochi. While I doubt that they escape pool play with a victory, their appearance alone in the tournament is a major victory for their national program. Outlook: The group winner will likely come down to the US and Russia although I wouldn’t be the least bit surprised to see the Slovaks steal at least one point from one of those two squads in preliminary play. Preliminary Standings: Russia (2-1-0-0), United States (2-0-0-1), Slovakia (1-0-1-1), Slovenia (0-0-0-3). Records are listed in order of Win-OT Win-OT Loss-Loss. Three points are awarded for a regulation win, two for an OT win and 1 point for an OT loss. The Canadians earned an easy berth in their pool considering some of the veteran talent that the Finns will have at this year’s tournament. The Canadians are an all-star team. There is no other way to describe the wealth of talent they’ll bring to Sochi. While goaltending was expected to be a question mark for the tournament, one of Carey Price, Roberto Luongo or Mike Smith will be able to carry the load for the stacked roster in front of them. Goaltending is the precise strength for the Finnish national team as each of their three goaltenders would start for just about every country in this year’s Olympic Games aside from, perhaps the Swedes or Americans. Tuukka Rask is likely the starter but Antti Niemi and Kari Kehtonen are equally capable of stealing a game on a nightly basis. There are some impressive, young talents on this roster that is still anchored by the old guard entering the tournament. If they get hot, they’ll be very difficult to beat. While Norway was thoroughly dominated in what turned out to be the strongest pool in the 2010 games (Canada, US and Switzerland), they enter the 2014 games with a stronger international resume and the experience of having played in an Olympic tournament just four years earlier. While they’ll surely see little success against the Canadians or Finns, I can see them stealing a preliminary round win over Austria before facing another superior opponent in the quarters. Austria, like Slovenia, is a new kid on the block. The presence of NHL players on the roster could give them a slight edge over the Norwegians in terms of depth. That NHL talent might just put them over the edge when it comes to their showdown with Norway. But with a pair of teams with very few players in North American leagues, it’s hard to pinpoint where each will end up. This is an interesting group as the Swedes will certainly enter the tournament as the prohibitive favorite amongst their three opponents. Sweden’s roster is an impressive collection of two-way talent with a ton of depth in the middle of the ice. Henrik Lundqvist will carry the load in the crease and I expect the Swedes to present a serious challenge for gold. A few interesting roster choices makes the Czech Republic a borderline group. While there are plenty of NHL names on the roster, they are bringing quite a bit of age along with them, notably, Petr Nedved and Jaromir Jagr. While Jagr has proven to be an ageless wonder, some of the other roster choices perplexed those in the hockey community. The Czechs will live and die with Ondrej Pavelec which, depending on your opinion of him, could be a precarious way to go about the tournament. I expect the Swiss squad to surprise people this year. Jonas Hiller is beyond dialed in at this point and they have seemingly progressed each and every year on the international stage. While they won’t likely pull any Belarussian surprises on the Swedes, I can definitely see them upsetting the Czech’s on their way to the elimination round. If Hiller isn’t at his best the Swiss will struggle. But if he continues the play he’s displayed this season, I’d expect them to grab a few wins. The Latvians wind up in a very challenging group and their path through the preliminaries may only be topped by the Slovenians. While fans in Buffalo will certainly be excited to see Ted Nolan behind the bench and Zemgus Girgensons on the ice, I doubt that the Latvian’s compete level will do enough to get them a win in the opening round. Based on my loose prognostications I have the Canadians, Russians, Swedes and Finns advancing with a first round bye, although the US and maybe even Switzerland could be in the conversation for a bye depending on their goal differential. Where I think a curveball might be thrown is in the path to the medal round. While the Canadians and Swedes will certainly advance to the medal round games, I could see the Russians or Finns upset along the way. I am hopeful that the Americans will be one of the four teams playing for a medal with Switzerland being my surprise pick to advance to the final four. From there I expect the depth of the participating teams to win out with the Canadians defeating Sweden for gold in 2014. All players get to the point when they have the opportunity to choose between a cage and a shield (or no facial protection). Typically that time is when you reach adult recreational leagues. Most adult leagues allow anyone over the age of 18 to play, which means that when players reach 18 years of age, they’ll finally have the choice of taking off their cage and upgrading to a visor should they choose that route. When it comes down to comfort and overall vision, the visor takes the cake every time. There’s nothing snapped up around your chin and nothing to obstruct your view of the ice. When it comes to safety, however, the cage wins out every time. Despite owning an Oakley visor, I wear a cage for all of my games. The reason I choose to go with a cage is strictly motivated by safety. I’ve see too many players get caught with sticks or pucks (I’ve caught a puck in the mouth myself) to justify wearing a visor. In addition, my vision isn’t all that bothered by a cage either. Perhaps it is because I grew up playing goalie and a player’s helmet offer so much more in terms of peripheral views as it is. Regardless, a cage is the choice for me. However, you may be in a different position. Determining if you want to wear a cage or visor comes down to little more than personal preference. If you’re comfortable with just a visor on, then you shouldn’t even think twice about wearing one. You’ll love the comfort that comes with little to obstruct your view of the ice. Picking that visor is where the decision making process will begin. There are a number of companies making visors today, but Oakley and Bauer stand above the rest in terms of quality and durability. Most visor purchases will come down to brand and design as each company offers a handful of different options. Great Skate offers both the Bauer and Oakley models in a straight or aviator cut that is more of a personal preference for the wearer. The aviator is a more stylized model with a curved bottom line which could affect what you look at depending on how focused you are on the bottom of the visor and the ice. The straight models are what’s seen a bit more often in the NHL as a majority of players opt for the simple look with their visor. Bauer recently introduced the Pro Clip visor line which utilizes all of their normal visor models but with a quick release, tool-less shield replacement when it comes time to start using a new visor. It’s an interesting development as putting a visor on a helmet falls somewhere between rocket science and flying on the difficulty scale. The one thing about the Pro Clip visors that I’m curious about is how often do they need to be changed? It would be somewhat worrisome if they consistently need to be replaced as a lack of durability would certainly be an issue. If a visor isn’t what you’re looking for, there are a ton of options for cages at Great Skate, including the CCM 580 which is a popular choice amongst a great many collegiate player. The Bauer RE-AKT titanium is a high-end model that offers a super lightweight option. However, the CCM might be the best designed cage out there. Bauer and Reebok each have a decent option for their helmets, but the CCM offers a good view of the ice and also passes the mirror test with flying colors. One other option, of course, is the full face shield. The Bauer Concept is a design that’s been around forever and has gained popularity in recent years and anti-fog treatments have made these far more manageable to use. If you’re considering making a switch to a visor or simply looking to pick up a new cage, keep this in mind as you’re making your choice at Great Skate.